The Student Art Showcase Committee would like to congratulate Maja Keefer for placing first in the Poster Design Contest. Maja is a Graphic Design & Communications student in the Visual Art & Design Department. Be sure to look for her design to grace posters, banners and electronic signage throughout the Salt Lake Community College campuses. The Committee would like to also thank all those who participated in the Contest. 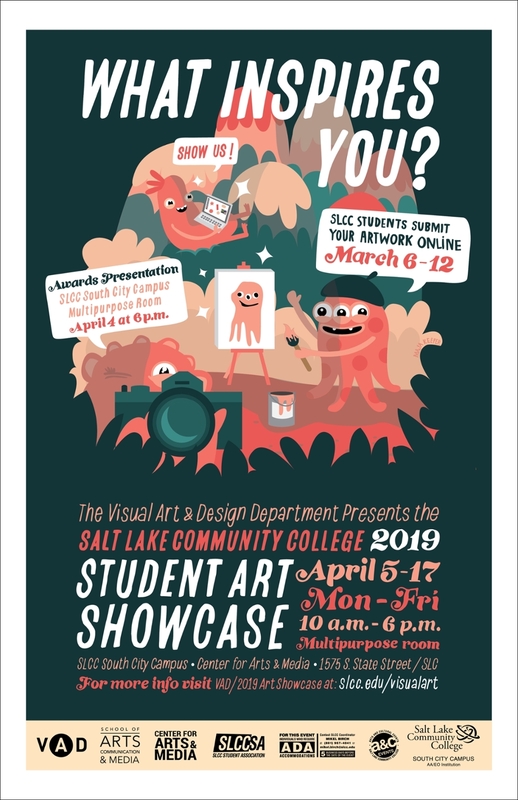 And… encourage all SLCC students to enter the Art Showcase this year. *Exhibit closes at 4:00 p.m. on April 17. SLCC students can submit artwork online March 6 – March 12. Note: Submission DOES NOT guarantee inclusion in the Art Showcase as submitted pieces will be juried first. For example: Four (4) submissions per student are allowed. 1, 2, 3, and/or 4 – or – NONE may be accepted for display in the Showcase.